2016 Hyundai Tucson Pros and Cons: Why (Not) This Car? For 2016, Hyundai has redesigned the Tucson, adding three inches of length and one of width to make it more clearly a compact crossover. (The first two generations fell in between size classes.) Beyond the dimensional changes, the new Tucson has a new, more efficient engine and transmission (though not in the trim level I tested), many new features, and a dollop or two of additional refinement. But the competition hasn't kept still. How does the new Hyundai Tucson stand out? Why the 2016 Hyundai Tucson? There's always at least one go-to category for any reviewed Hyundai, Kia, or (yes, they're still around) Mitsubishi: the standard warranty. It's 5/60 "bumper-to-bumper" (with exclusions in the fine print--read it) vs. most others' 3/36 plus 10/100 (original owner only) on the powertrain vs. the others' 5/60. Once upon a time, Hyundais were purchased because they were cheap. But as they've gotten better they've gotten less cheap. The least-expensive 2016 Tucson is $1,050 more than the least-expensive 2015 Hyundai Tucson. Yes, they've added a little more than that amount in new standard features, but those who only care about the lowest possible price will find the new Tucson less attractive. Even with the price increase the $23,595 Tucson SE still undercuts the Mazda CX-5, Honda CR-V, and Ford Escape by $480, $900, and $260, respectively, before adjusting for the Hyundai's relatively high level of standard content, and by about $1,800, $1,600, and $1,400 afterwards. These amounts aren't large enough to make the new Tucson the clear choice if it wasn't nearly as good a vehicle as the others. But if it's a little worse in some ways, a little better in others, and overall about the same, then even a few hundred dollars could be the deciding factor. All of these compact crossovers are offered with far more features than you'll find on a base model. What happens when they're all similarly loaded up? A Tucson Limited with all-wheel drive, Ultimate Package, and floor mats lists for $35,155. This is $520 less than a Ford Escape Titanium, but $1,010 more than a Honda CR-V Touring and $1,800 more than a Mazda CX-5 Grand Touring (when all are fully optioned). How can this be? More features are available on the Hyundai than the others. Adjust for these, and the Tucson undercuts them by about $700, $1,700, and $250, respectively. Except in the case of the Honda, the Hyundai's price advantage is narrower when you load it up. A key reason for this is that trim levels other than the SE are fitted with a 175-horsepower turbocharged 1.6-liter engine instead of a 164-horsepower non-turbocharged 2.0-liter engine. Also, with Mazdas the top trim level tends to be the best value. As suggested by the feature adjustments in the price analysis, the new Hyundai Tucson is available with more features than any of its direct competitors (save the related 2017 Sportage due next spring; Kia feels compelled to one-up its big brother). Features available on the Tucson but not the CR-V include: proximity liftgate opener (just stand near the back bumper for a few seconds), blind spot warning system (the Honda has a passenger side blind spot camera instead), rear obstacle detection, torque vectoring (for more balanced handling), a telematics system (similar to OnStar), a panoramic sunroof (the CR-V roof includes a standard-sized opening), steering-linked xenon headlights, a power front passenger seat, cooled front seats, heated rear seats. That said, you can get some features on the Honda but not the Hyundai: adaptive cruise control, lane keeping assist system (the Tucson only has lane departure warning), and memory for the driver seat. The CX-5's feature set is similar to the Honda's, except the Mazda offers forward collision warning, auto-dimming LED headlights, and (like the Hyundai) a blind spot warning system, but it isn't available with a power liftgate or (like the Hyundai) lane keeping assist or driver seat memory. Also, the Mazda's auto-braking system might cover a broader speed range than the systems in the other two vehicles. The Hyundai, Honda, and Mazda all offer more safety features than the 2016 Ford Escape (which could gain similar features with an update for 2017). The new Tucson is the clear winner in luxury features. If you want a big sunroof, cooled front seats, or heated rear seats, it's the one. The new Hyundai Tucson feels more solid and rides more steadily than its 2010-2015 predecessor. Sportier competitors like the Mazda CX-5 and Toyota RAV4 ride more firmly. They also don't feel as solid or as refined. But I haven't driven the new Honda CR-V, and the Ford Escape manages to combine sportyish handling with a premium feel. The ride of the increasingly dated Chevrolet Equinox benefits from an unusually long wheelbase and compliant suspension tuning, but it's also a larger, heavier vehicle. If the Tucson isn't the best-riding truly compact crossover, it's close, especially in terms of composure. The new Hyundai Tucson is also quieter, and could be a contender for best-in-class in this area. Still, the tested SE didn't seem at all upscale or luxurious, perhaps because it was the base trim with a light gray interior. Or maybe, even though the total quantity of sound is low, Hyundai could better tune the quality of the noise that remains. The Mazda CX-5 doesn't suppress road noise as well and its engine sounds more coarse, especially compared to the Tuscon's uplevel engine. Why Not the 2016 Hyundai Tucson? The redesign improved the Hyundai Tucson's fuel economy, but not by enough to rank it near the leaders. With the SE's 2.0-liter engine and six-speed automatic transmission, the Tucson rates 23 mpg city and 31 mpg highway with front-wheel drive and just 21/26 with all-wheel drive. Stepping up to the turbo 1.6-liter engine and seven-speed dual-clutch automated manual transmission improves these ratings to 25/30 with FWD and 24/28 with AWD. Alas, even though it has a larger, 2.5-liter engine the Mazda CX-5 achieves 26/33 with FWD and 24/30 with AWD. And the Honda CR-V, with a 2.4-liter engine, leads the class: 27/34 with FWD and 26/33 with AWD. Even with its uplevel engine the new Tucson doesn't approach these figures, especially not on the highway. The best suburban trip computer average I observed in a Tucson SE with FWD was 32 mpg. Decent, especially compared to the previous generation of compact crossovers, but others within the latest crop can travel at least a few more miles per gallon. The new Hyundai Tucson handles very competently and safely, but without even a hint of sportiness. It doesn't help that the crossover's steering feels numb and artificial even compared to a thoroughly mainstream car like the Hyundai Sonata. The Mazda CX-5 is more fun to drive thanks to more naturally weighted, more communicative steering, a greater willingness to turn, and sharper handling. Even it is short of a blast, though. The 2017 Kia Sportage, though related to the Tucson, will employ a different type of electrically assisted steering (rack-mounted instead of column-mounted), which should provide better feedback and be more engaging. The Tucson is the compact crossover to buy if you just want a safe, comfortable vehicle to get from Point A to Point B. The largest shortcoming in need of rectification might have been cargo room, and most of the Hyundai Tucson's three-inch length increase appears to have gone into its rear end. Yet the Tucson remains three inches less lengthy than the CX-5 and CR-V. Correspondingly, while cargo volume behind the Hyundai's second row has increased from 25.7 to 31.0 cubic feet, this still doesn't match the Mazda's 34.1 or the Honda's 35.2. Seat-folded volumes rank similarly: 61.9, 64.8, and 70.9. Is this a deal-killer? Only if you won't have quite enough space for your stuff in the Tucson. For nearly everyone in nearly every situation there will be more than enough. One feature offered on past Tucsons that is no longer offered on any of the crossovers I've been discussing: a folding front passenger seat. With some styling cues lifted from BMW's crossovers, the third-generation Hyundai Tucson is a handsome vehicle, but not a distinctive one. The tested SE's 17-inch wheels befitted a transportation appliance. Yes, 17s were considered large a decade ago, but the new Tucson needs the 19-inch wheels on the Sport and Limited to look its best. It doesn't help that the new Tucson, like the Mazda CX-5, has wide black plastic cladding around its wheel openings, which make said openings appear much larger than they actually are. 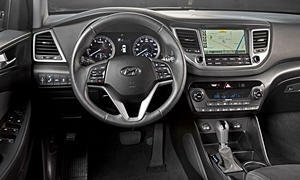 The third-generation Hyundai Tucson's interior styling is similarly tasteful, but not distinctive. The Limited's interior understandably appears significantly more upscale than the base trim's. The tested SE had a light gray interior. Light gray does nothing for any interior. Even in the Limited (as in most competitors) you'll come into contact with a fair amount of hard plastic, some of which has an "economy" appearance. The Mazda CX-5's interior has sportier styling, but it doesn't feel as roomy up front partly as a result. With the partial exception of the Ford Escape, nearly all compact crossovers have roomier rear seats than much of the public seems to realize. Two adults will fit with room to spare. In the Hyundai Tucson, as in some others, the rear seat back reclines. According to the official specs, the Mazda CX-5 has about as much rear legroom as the Tucson. In reality, though, it has two-to-three inches less rear knee room. Both available engines accelerate the new Hyundai Tucson more than adequately but well short of thrillingly. You can get far more powerful engines in the Ford Escape, Kia Sportage (that sibling rivalry), Subaru Forester, and Volkswagen Tiguan. Between the two Hyundai engines, the turbo 1.6-liter doesn't produce much more peak power than the non-turbo 2.0-liter, so full-throttle performance doesn't vary greatly. But the turbo engine has a much more stout midrange: peak torque of 195 lb-ft at 1,500 rpm vs. 151 lb-ft at a much higher 4,000 rpm. As a result it doesn't have to be revved nearly as much in typical daily driving. With the turbo engine, the Tucson is about as quick as a CR-V or CX-5; figure eight seconds from a dead stop to 60 mph. The associated dual-clutch automated manual transmission, though, isn't always smooth at low speeds (a common complaint about this type of transmission). The rating applies to the Tucson I spent the most time driving, an SE with the 2.0-liter engine. My initial impression of the new 2016 Hyundai Tucson was that it was thoroughly competent and even surprisingly polished (compared to other compact crossovers in its price range), but boring. My evaluation didn't evolve much over the course of a week. If you want a compact crossover with the most features and/or for the lowest price, then the new Tucson very well could be the one for you, especially if refinement and ride quality are much higher priorities than sporty handling. But some other compact crossovers are more fun to drive. The largest challenge could come from within the Tucson's extended family. The related 2017 Kia Sportage should at least match the new Tucson in features and value and will probably top it in driving enjoyment. Hyundai provided an insured vehicle for a week with a tank of gas. Reeven Sana at Suburban Mazda of Troy (MI) provided a CX-5 for a test drive. He can be reached at 248-519-9583. 2016 Hyundai Tucson pros and cons, according to Michael Karesh: the best reasons for buying (or not buying) the 2016 Hyundai Tucson. Join TrueDelta to post your own impressions. Great review Michael. As our '04 Forester neither rides very softly nor is particularly quiet those attributes certainly hold an appeal even if the car is boring. I wish Hyundai would offer the safety pack on lower models as Subaru does. I think they missed the boat on that one. Hyundai was at the forefront for safety in '06 with ESC and airbags. Now they are kind of an also-ran. Maybe they were more hungry back then or they have a sharper focus on costs now. It seems to me that people want these packages and even Honda is offering them on lower models now, aren't they? It looks like the new Elantra will offer more choices. Even with the head gasket issue we'll probably give the Forester first consideration next summer if we look for a replacement. Assuming the oil burning issue is behind them. I'd like to see them tweak ride and reduce noise on the '17 Forester although I'd have to go back to your review as I don't recall your take on both. This being a mid-cycle refresh, maybe they will improve both. The current Forester is definitely smoother and quieter than past Foresters. Honda and Subaru are leading the way with safety packages on lower trim levels, and I expect many others will follow soon, or lose sales. While I am a Hyundai/Kia partisan, Kia seems to benefit by presenting their cars 6 to 12 months after the Hyundai version. I almost bought a slightly used Sportage a couple years ago; it was 'just right' in so many respects. But now I am looking forward to the 17 Sportage, and even more to the 17 Niro. It's disappointing that H/K can't improve the fuel economy on the Tuscon/Sportage, which is what makes the Niro such an interesting prospect. Having just sat in the new Tuscon in the showroom, I was quite impressed with its passenger volume. As for interiors, my tastes are different. I've come to prefer all white/light, or all black. Light-colored interiors are a cheery place to be, and black ones age better than the gray that discolors over time. My $0.02. Thanks! I talked about the Kia-Hyundai relationship in my review of the 2016 Sorento. The Tucson and CX-5 are on my wife's short list. From what I've read, the Tuscon with the 1.6 turbo and CX-5 with the 2.5 are about equal in peformance, near sea level at least. But what about at altitude? I live in Colorado at 5000 ft and travel into the mountains up to 11,000 ft. How will these engines compare when altitude is taken into account? I'm assuming the turbo will do better. Is that true and how much difference will it make? Turbos are usually better at altitude, but I've never seen a formula for how much difference they make. Neither engine feels especially strong even at sea level, though. If you really want a quick one (and maybe you're just seeking adequate), then the Subaru Forester XT is probably the way to go. The Tucson might be quick enough for your needs. The Forester XT could be overkill. It depends on how quick you need a crossover to be. It might also be harder to get a discount on the Subaru. 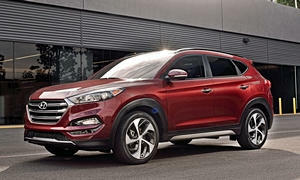 Just want to add that there is a long thread about the Tucson DCT at Hyundai-forums.com. There are a sub group of people complaining about situations in which they attempted to accelerate from a stop and the car did not move. Also noted is that Hyundai released a firmware update in the last two weeks. Aside from this some people seem to have trouble adjusting to the feel of a DCT around town. We just got our first CVT based car (Forester) and we aren't having an issue adjusting to it. Everyone is different in their sensitivity and expectations. sb222's info about problems with the Tucson's transmission are worrisome, although I'm fine with the "normal" behavior of DCT's. I had a 2006 Audi A3 and it occasionally shifted roughly at low speeds. But overall I really liked its DCT transmission. I have no experience with CVT's. Prior to buying, I don't think I'll know how any of them do in the mountains, but the Hyundai looks like my favorite based on price compared to the 2.0XT and engine compared to the 2.5i. I'm assuming the lower HP of the Sport compared to the 2.0XT won't be a deal killer. The Forester XT is much quicker than the others. The Mazda CX-5 is also a very good choice. They're nearly as popular with members as the Forester.